Singapore – On January 29, Tuesday, a driver was stopped by Traffic Police officers along Jurong Town Hall Road because he was not wearing a seatbelt. The 27-year old, however, became violent and even assaulted the two officers when the latter found that the driver already had an outstanding warrant of arrest. Netizen Ada Wang uploaded photos that he took of the incident and shared it to Singapore Taxi Driver’s Facebook page. The driver could be seen being detained on the ground while surrounded by at least nine police officers. According to the police, the investigation went beyond a mere offence for not wearing a seatbelt and transformed into one that is drug-related. Substances that were suspected to be controlled drugs, a knuckle duster, and other drug-related equipment were seized by the police. 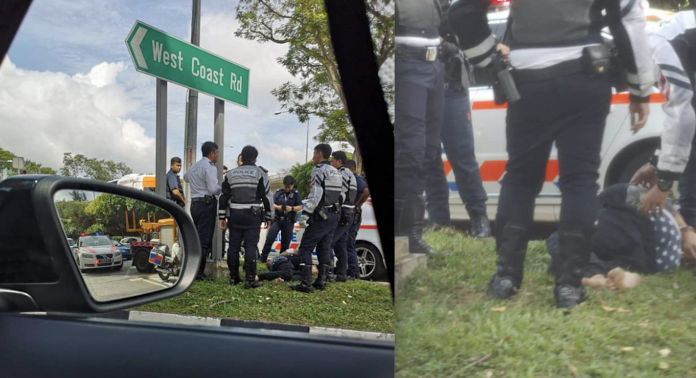 “On 29 January 2019 at 10.32am, Traffic Police officers were patrolling along Jurong Town Hall Road, when they stopped a car driven by a 27-year-old man for failing to wear a seat belt. During the check, the man was uncooperative and was established to have an outstanding warrant of arrest. He was violent and assaulted two officers during the arrest. Substances suspected to be controlled drugs, drug-related paraphernalia and a knuckle-duster were also seized from the man’s vehicle. As per the law, any person convicted of voluntarily hurting a public servant on duty can face up to seven years in prison, a fine, caning or a combination of those previously stated punishments. The driver will have his hands full if he is faced with multiple charges and violations. More updates on the investigation will be uploaded. Meanwhile, netizens are commenting at the increasing drug-related cases surfacing in the country as well others showing their agreement for the death sentence.